« Secret Wine: I’ve just voted, but have I got it right? This is fantastic. It’s a blend of seven different grape varieties (Syrah, Carignan, Cabernet Sauvignon, Mourvedre, Counoise, Grenache Noir, Terret Gris), made without any oak. And it manages to catch an almost Burgundian precision and elegance, with a natural, unadorned purity to the fruit. This is the sort of southern French red that I love. I was drinking this on Friday. Really lovely. Their Rendez Vous de Soleil (2006) is even better. Try also their complex Lo Vielh from 100 year old Carignan vines. 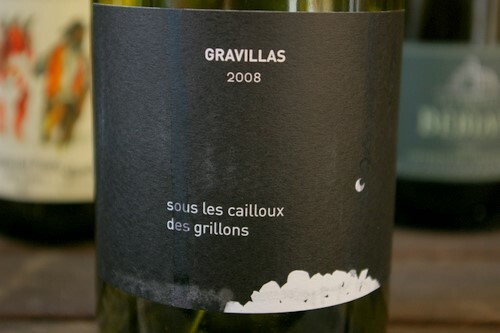 Had a bottle of L’Inattendu, the Gravillas white, the other day, made from a small parcel of very old Grenache Gris. It was superb. Wow, thanks Jamie (and Matthew and Doug). 2010 Grillons just pressed today (well about 3/4 of it). Hope we can live up to these sweet comments. John, good luck with the harvest, and thank you for making such lovely wines! Almost done. The 1911 Carignan tomorrow, 1972 carignan Tuesday, cabernet/mourvedre/counoise sometime soon after. Pretty easy harvest. One of the advantages of zero rain since June is that absolutely nothing has gone soft, grey or fuzzy so there’s been no need to pick out ugly bits. Good thing I got my little crawler tractors up and working and did a lot of plowing last spring. It wasn’t a year for having grass between the vines. Will keep trying.